KENGEL 【HIGH QUALITY】100% brand new and quality guarantee.The dog chest strap made of soft material and padded at all adjustment points to ensure your pet's comfort. 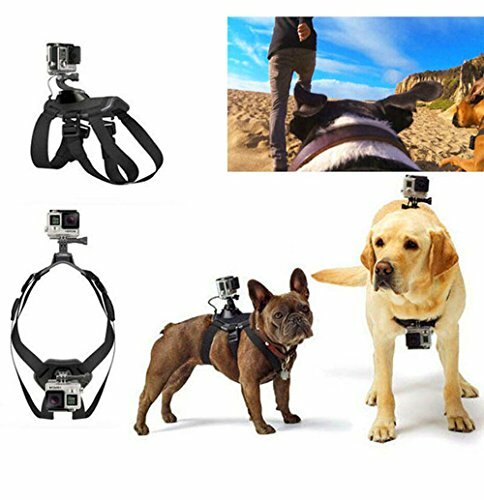 【VARIOUS PERSPECTIVES】The harness features camera mounts on the back and chest for a variety of perspectives - from bone-chewing, digging and front-paw action, to over-the-head shots of playing, running, jumping, digging , sniffing and more. See the world from your dog's point of view. 【ADJUSTABLE】Suitable for from 15 pounds to 120 pounds (7kg to 54 kilograms) of large, medium and small dogs,such as Teddy, Chihuahua, Miniature Pinscher, Schnauzer, Samo, Husky, Golden Retriever, German Shepherd, Rottweiler, Alaska, Tibetan Mastiff.For smaller dogs, chest straps can be removed. 【HYGIENIC AND WASHABLE】It can be washed by hydrophilic material, you can rest assured that your dog will play dog swimming, do not worry it will be very dirty. 【COMPATIBILITY】Action Cameras: GoPro HERO6,GoPro 5 Session,GoPro HERO5 black,GoPro 4 Session,GoPro HERO4, GoPro HERO3 +, GoPro HERO3, GoPro HERO2, GoPro HERO1, SJ4000, SJ5000, SJ6000, Xiaomi, Xiao Yi etc. If you have any questions about this product by KENGEL, contact us by completing and submitting the form below. If you are looking for a specif part number, please include it with your message.